DJ Awards, 21st edition was undeniably the most memorable edition to date, with the celebrations reaching a spectacular high, at the new home this year, of Heart Ibiza, a venue that fuses art, music and gastronomy. This 21st edition also welcomed new sponsor Grey Goose. Paying homage to the era of Disco, theglitterballs were out in force with as were the DJ´s, and the electronic music industry. Graham Sahara and Katie Hayley Knight hosted the ceremony and were tasked with presenting 27 awards representing the heavyweights, the newcomers, and the influencers. 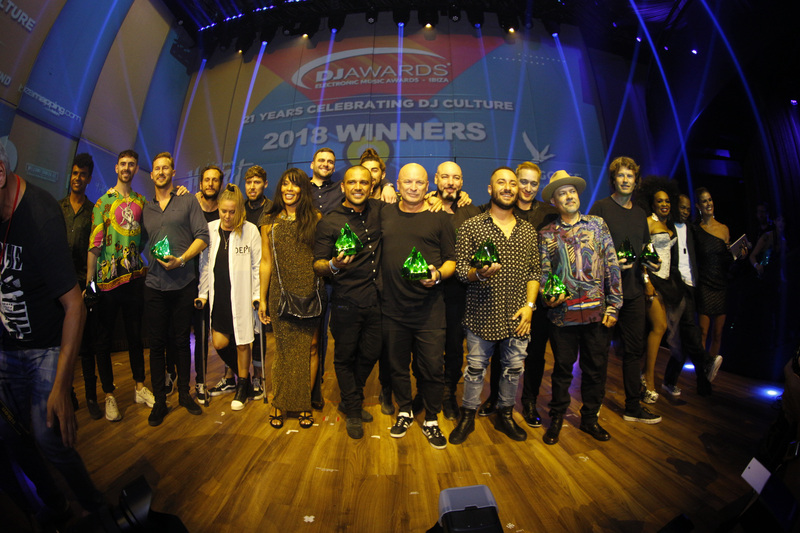 The awards celebrate and honour DJ music category awards that were voted for by the music fans, plus the special industry award, chosen by a panel of music professionals. Joining the line-up of the awards this year were some of electronic music´s biggest names, amongst them, we had the larger than life Carl Cox who won one of the most popular amongst the voters, International DJ. This year, 4 of the popular music categories were split into Artist and Master categories allowing a new layer of talent to be included within the awards. Amongst the Master winners were Jamie Jones for Tech House Master, who has nearly completed his 7th season with his party Paradise, Trance Master went to Paul van Dyk, who began his residency at the newly launched party Shine. Newcomer to the awards, Joseph Capriati, one of the busiest DJs on the planet, he was presented with the Techno Master award and House Master went to the S-Man himself Roger Sanchez, the don of the 4 decks! Artists awards went to Grammy nominated Camelphat for House Artist. No. 3 is lucky as Patrick Topping picked up his third DJ Award, this time for Tech House Artist. Chart topping Ben Nicky took home Trance Artist, whilst Progressive House went to Hernan Cattaneo, who was last presented with the Kryptonite award 17 years ago, for Newcomer. He also collected the award for Dance Nation on behalf of Argentina, being one of their most famous exports. Melodic House &Techno went to Solomun and Black Coffee won the Deep House award for the second year running. Newcomer went to rising star Alex Kennon, whose air miles must be exploding having globetrotted around the world playing at high profile festivals It´s been a good year for Max Chapman, head of his own label Resonance Records, had his 2018 debut on Pete Tongs Radio 1 Essential mix and now is the proud owner of the Breakthrough award in association with Beatport. Special Awards that were presented included, Track of the Season “Your Mind” was picked up by Adam Beyer and Bart Skils, a track that was originally created as a dj tool and was heard across every club dance floor around Ibiza. Deeperfect the underground Italian techno label won Record Label of the Year, and was presented to the founder Stefano Noferini. Outstanding Achievement was awarded to Sven Vath, whose career has spanned well over 30 years and is recognized for cultivating the underground electronic music scene not just in Germany but in Ibiza as well. Ibiza Night went to Resistance, after a hugely successful season at Privilege this year with their dynamic production and in-demand line-ups, Founder Russell Faibisch joined us before he went off to celebrate their closing party. Electronic Live Performer went to Stephan Bodzin, and International Music Festival in collaboration with Faze Magazine was picked up by Caprices Festival, set in the gorgeous setting of the Swiss Alps with a line-up that packs a techno punch. Producer powered by Focal went to London based DJ producer Archie Hamilton, owner of 3 respected labels. Electronic Music Pioneer went to Masters At Work, true pioneers of their sound, fusing everything from house, hip hop, funk, disco, latin, African, jazz and minial into a universal groove, the duo have been working together since 1990 and still going strong! Ibiza Music Event winner was Storytellers Ibiza, Dancing in Dreamland Chapter II, with a party that people are still talking about the set from Luciano b2b with Ricardo Vilalobos. One of the most popular Industry awards Ibiza DJ, went to Clara Da Costa, who at 17 became the first female to hold a residency in Ibiza, fast forward a couple of decades and she is a force to be reckoned with hosting her own radio show, and head of Jacks House Recordings. All the DJ winners received a pair of Focal Listen Professional Headphones, an essential work tool for music production by the Brand of Acoustics Experts Focal. The winner of their sponsored award of Producer, Archie Hamilton was also given a pair of shape-65 Speakers, no doubt they will hold pride of place in his studio! Barbara Tucker who is celebrating 30 decades in the industry, entertained the packed venue of the invited audience of the music industry that decamps to Ibiza every summer, with a rendition of one of Disco music´s anthems “MacArthur Park”. The winners all came back on stage for the tradition winners photo, and then the party started with Heart Factory, including nominees Blond:ish, Themba and Satori Live, officially packing the club into the early hours.